Establish co-ordination with line department for Disaster Management. Establish contact with financial institutions in Two-way and many-way manner. Geographically Odisha is a disaster prone state. If we will analyze the History of occurrence of disaster in Odisha then it can be better analyzed that every year disaster beats Odisha in many ways. 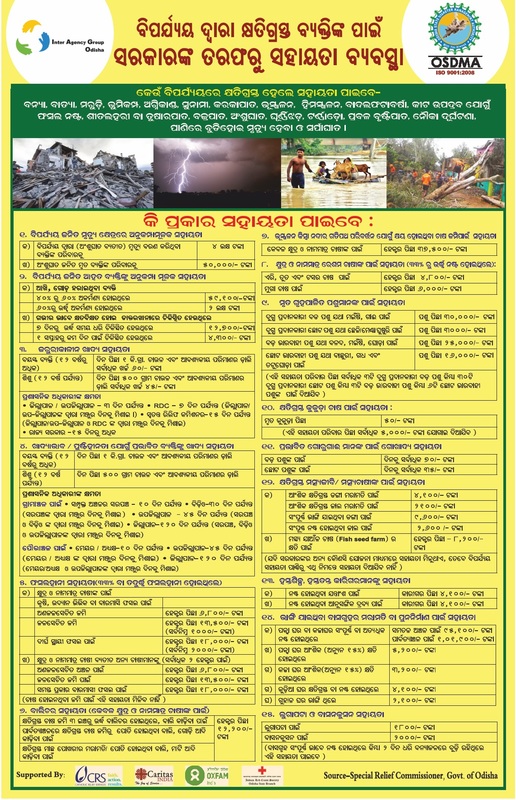 A part from severe kind of natural disaster, every year Odisha is subjected to other natural disaster such as Sun Strokes/Heat waves, Lightning , Whirl wind, Heavy rain, Boat accident &amp; Tornado etc..These calamities not only creates huge losses of lives and damages of properties, but also severely influenced the social, cultural and economic development of the human beings. Continuous occurrence of these disasters destroys the livelihoods of small &amp; marginal farmers, agricultural laborers, village artisans and poor buy making them vulnerable. Due to the prompt &amp; timely action, proper planning &amp; management for post disaster relief measures, Rescue &amp; Rehabilitation measures, now Odisha has been recognized as a pioneer state all over the world in the field of “Disaster Management”. Odisha has been recognized as a role model in the country, for its excellent disaster management techniques to tackle different natural calamities like devastating flood, phylin, Hudhud, cyclone, drought etc. in a successful manner. After experiencing the devastation of super cyclone, the state Govt. has emphasized the participatory planning/measures to minimize the havoc of disaster &amp; built Odisha as a disaster resilient state is the country. In order to aware &amp; sensitize the community to achieve successful Disaster management, now “Mock Drill” is being organized in all 30 districts of the state. Mitigation and prepared measures are being taken throughout the year to minimize the havoc of disaster . The weather forecasting system by IMD is helping a lot to predict the possible rainfall quantity in different area of the state and accordingly making it possible to take different preparatory measures to tackle possible flood situation in the state. Every year State Level preparatory meeting is being commenced with the participation of all line departmental officials under the chairmanship of Special Relief Commissioner. Apart from this pre-cyclone exercise &amp; Pre-flood preparedness meetings are organized to review the readiness to face any unforeseen situations due to flood &amp; cyclone in the state. The Line Department Official and the Collectors are being advised to keep a vigilant look on such situation. In our state there are 879 multipurpose flood Shelters &amp; cyclone shelters which has been constructed by the state Govt. to provide shelter facilities to the evacuees, the victim of disaster like flood &amp; cyclone. In Kalahandi also there are four numbers of MFS (Multipurpose flood Shelter) has been constructed by the state govt. for the purpose. During the period of natural calamities, the distress evacuees can take shelter in these MFSs . Provisions are being taken to equipped these MFSs with necessary emergency equipments, electricity , drinking water facilities and steps are being taken to ensure special provision for sheltering the women, children &amp; livestock resources during such devastating period. The multipurpose flood shelter management committees are there to monitor the proper maintenance of these MFSs prevision are there to aware &amp; sensitive the people by taking initiative for community based capacity building measures for them. Strengthening of early-warning dissemination system i.e. to disseminate information before the occurrence of any disaster in order to expedite the process of rescue & relief operation has been achieved. The State & District Level emergency control room with all necessary equipments has been streamlined with 24/7 hours Services. “Alert Siren Towers” has been constructed in 122 places of 22 blocks of Six disaster prone coastal Districts in order to disseminate the warning message to people before occurrence of any disaster. The people can get the warning messages regarding occurrence of Tsunami/Cyclone from these Alert Siren tower. The ODRAF Team is supplied with Satellite phone in order to avoid any Tele-connectivity problems during disasters. Again In order to expedite the relief & rescue operation during calamities Ten numbers of ODRAF team has been provided with capacity building training and supplied with power boats & necessary emergency equipments. Another ten numbers of ODRAF teams also has recently been formed for the purpose.Like wise the fire fighting team in the State has also been Capacitate and supplied with necessary emergency equipments. The Central Govt. has enlisted 12 nos. of natural calamities i.e. Flood/Cyclone/Drought/Earthquake/Fire accident/Tsunami/Hail storm/Land Sliding /Cloud bursting / paste attack /cold wave/avalanches under the National Disaster Relief Fund(NDRF). But as Odisha is a disaster prone State, therefore in order to compassionate the victim or NOKS of the victim who has been injured or dead due to the State Specific another eight numbers of natural calamities or local disasters as listed by the State Govt. i.e. Lightning/ Heat wave/ Sunstroke/ Tornado/ Whirlwind/ Heavy rainfall/ Boat accident/ Drowning /snakebite, they will be entitled to receive the ex-gratia assistance under State Disaster Relief Fund (SDRF). The State Government is taking all type of necessary precautionary measures to aware and tackles the severe heat wave situation in the state. In order to fava the drought situation in the State , necessary precautionary measures are also being taken by the Government. The State govt. has formed one Drought monitoring Cell in OSDMA ( Odisha State Disaster Management Authority) for management of Drought Situation in the State.